Our Philadelphia law office is conveniently located in the city of Philadelphia which is the largest city in Pennsylvania with an estimated population of 1,560,297. It is the seat of its own county. Philadelphia is best known for its famous residents of colonial era days, William Penn and Benjamin Franklin and for being the meeting place for the Founding Fathers of The United states who signed the Declaration of Independence in 1776. Currently we are well known for our cheesesteaks, hoagies, loyal sports fans and appreciation of good food from a variety of cultures and ethnicities who have settled here. Whats less well known is that 32% of its motorists are driving uninsured motor vehicles. We handle all types of personal injury cases that happen in Philadelphia including auto accidents, truck accidents, pedestrian accidents, SEPTA accidents, tour bus accidents, motorcycle accidents, work accidents, train accidents, slip and fall accidents, construction related accidents, medical malpractice, baby birth injuries, drug injuries and wrongful death. However, most personal injury cases we see happen in Philadelphia occur when a person is injured while riding in a motor vehicle of any type that is involved in a motor vehicle accident in the city. When an accident happens the lack of insurance can be costly for all concerned. Did you know that one area in Philadelphia has the third highest insurance rates in the United States? 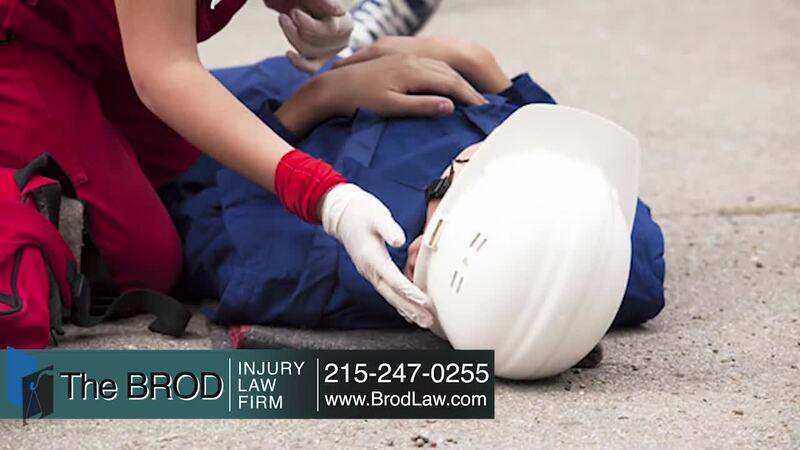 The Brod Law Firm is recognized among Pennsylvania's top law firms for representing those seriously injured due to the fault or negligence of others. The Firm's personal injury lawyers in Reading, Philadelphia, and Bala Cynwyd handle cases of victims who sustained injuries as a result of negligence on the part of another person or business. Simply put, our goal is to get the injured personal injury victim the best result possible. If it can be proven that the victim sustained injuries because of negligence on the part of another individual or business, the victim is entitled to monetary compensation for medical bills, lost wages and pain and suffering with the goal of achieving top results. Because Gary Brod is a Philadelphia personal injury lawyer who knows how to try personal injury cases and win; he knows how to win top settlement results for his injured clients. Why Go Into Center City? You want an experienced Philadelphia personal injury law firm but why should that mean you have go downtown? No problem. One of our several offices will work best for you to have top rated Philadelphia personal injury attorney Gary Brod handle your case or we will come to you if you prefer. We are convenient to all areas of Philadelphia and nearest to Northwest Philadelphia, Lafayette Hill, Chestnut Hill, Mt. Airy, Germantown, East Oak Lane, West Oak Lane, Northeast Philadelphia, Glenside, Jenkintown, Cheltenham and Willow Grove. Our Bala Cynwyd personal injury attorney's office directly off City Line Avenue is very convenient to many areas including the Main Line, i.e Merion, Merion Station, Haverford, Upper Darby and Havertown as we are close to Route 76 (Schuylkill Expressway) heading east towards center city and south Philadelphia and westbound towards Plymouth Meeting and Valley Forge.The Bala Cynwyd office is also very convenient to the Philadelphia areas of Manyunk, Roxborough, East Falls, Overbrook Park and West Philadelphia. Of course, we have our Reading offices serving our clients in that region which includes the areas of Pottstown, Allentown, Ephrata and Lancaster. What Do You Get When You Choose Philadelphia Attorney Gary Brod? What Must Be Proven In Your Personal Injury Case? 19101, Center City 19102, 19103, 19104, 19105, 19106, 19107, 19108, 19109, 19110, 19111, 19112, 19114, 19115, 19116, Chestnut Hill 19118, Mt. Airy 19119, Olney 19120, 19121, 19122, 19123, Frankford 19124, 19125, West Oak Lane 19126, Manayunk 19127, Roxborough 19128, 19129, 19130, West Philadelphia 19131, 19132, 19133, 19134, 19135, 19136, 19137, West Oak Lane 19138, 19139, 19140, East Oak Lane 19141, 19142, 19143, Germantown 19144, 19145, 19146, 19147, 19148, 19149, Cedarbrook 19150, Overbrook 19151, 19152, 19153, 19154, 19155, 19160, 19161, 19162, 19170, 19171, 19172, 19173, 19175, 19177, 19178, 19179, 19181, 19182, 19183, 19184, 19185, 19187, 19188, 19190 19191, 19192, 19193, 19196, 19197, 19019, 19092, 19093, 19099, 19244, 19255 We see many Philadelphia personal injury cases from the far Northeast, Center City, Southwest Philadelphia, North Philadelphia, Mt. Airy, Chestnut Hill and South Philadelphia. Top rated Philadelphia personal injury attorney Gary Brod's straightforward approach and painstaking preparation ensures the success of the cases he accepts for your Philadelphia personal injury lawsuit. This strategy has been developed and refined through 30 years of trial practice, training and thousands of cases. We prepare each and every case from day one as though it will be tried in a courtroom. Gary Brod leaves nothing to chance that can be avoided. This process begins from the moment we accept your case. But this office is not an accident mill where we use a "cookie cutter" approach, as no two cases are the same and we take all cases we handle seriously because we get that its your one case. Your case is unique and treated as such. The fact is that the majority of cases are settled before trial. Attorney Gary Brod and his team know that our opponents will take your case and us seriously if they know we have all the ammunition and are ready, willing and able to proceed to trial if a satisfactory settlement offer is not made. What Steps Should I take If I believe I Have a Personal Injury Case? Our personal injury lawyers recommend Pennsylvania personal injury victims take these important initial steps if you believe that you have been injured because of the negligence of others. First, if it is a slip and fall, document the incident and make sure it is reported to the property owner and police if possible at the time. If you are in a motor vehicle accident of any type, Pennsylvania law pursuant to 75 Pa. Cons. Stat.section 3746, states in a nutshell that your accident should be immediately and quickly reported to the police when there is an injury or death or when the vehicle is immobile or too dangerous to be moved. If a police officer does not show up as as required by section 3746 to investigate and file a report, what should you do? Section 3747 requires that the driver or owner must take the responsibility to file their own report. This must be submitted in writing within five (5) days of the accident. On any personal injury matter make a mental note of what happened and how it happened? Was the alleged responsible party ever warned in the past that he or she was being negligent? Next, take pictures of any injuries you may have suffered. Since most folks have mobile phones which can take photos, get a picture of the defect if there is a fall or of the spilled liquid on the floor of the supermarket or shopping area. Our personal injury attorneys in the Philadelphia and Reading, Pennsylvania area also recommend that you take pictures directly after receiving injuries to show the extent to which you or your loved one suffered. At The Brod Law Firm our personal injury attorneys work for victim rights. Because Lawyer Gary Brod has been widely known and has been verified as the voice of injured victims consistently for over 30 years you will be assured that he is 100% in your corner. Call now for the results you deserve to speak to one of our expert personal injury lawyers in Reading, Philadelphia or Bala Cynwyd. Insurance companies have trial lawyers. Why shouldn't you have the benefit of an experienced personal injury trial lawyer on your side to get the best settlement possible? Call Gary Brod anytime at 888-435-7946 (888-HELPWIN) for an immediate free no obligation telephone consultation and explanation of your legal rights. We have the option of an easy phone sign-up process or contact us online and we can begin work today. We are waiting to hear your story and would be honored to review your case and to fight vigorously for you. Even if you are not sure you have a case we encourage your call. We will not charge you for speaking with us and providing legal advice.